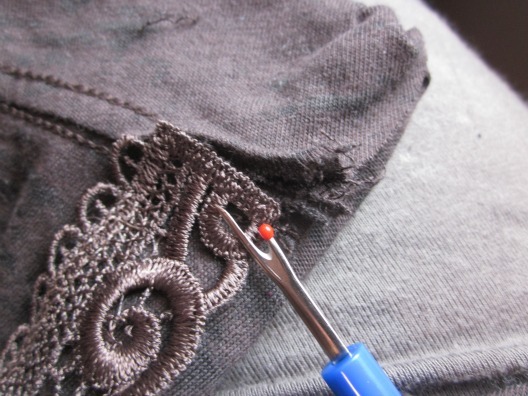 I started with a plain tee shirt and a piece of purchased lace. 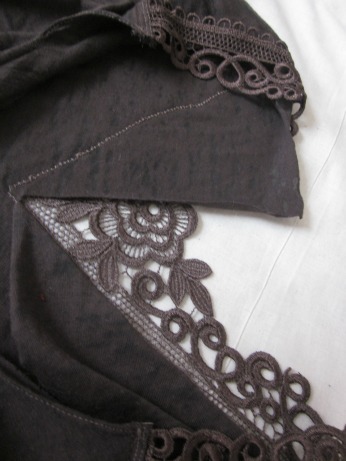 I got a variety of lace panels from a now-defunct Etsy shop, but searching for “lace applique” or “Venice lace” on Etsy still turns up a huge number of great options. 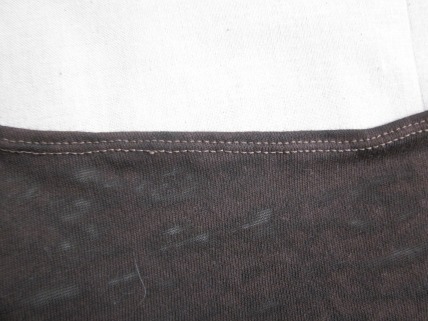 I like to use a twin needle for tee shirts, because it lets the jersey stretch. Since the applique is fairly rigid and non-stretchy, I don’t know how important that is, but you’ll see all the stitching for this is double. 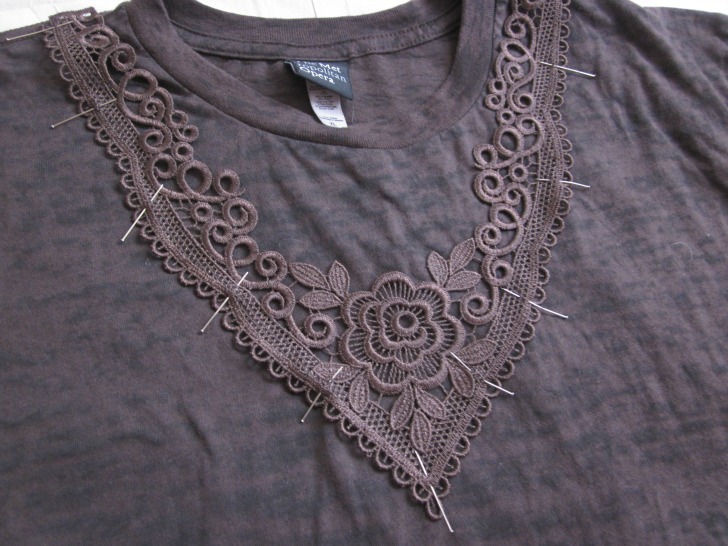 I started by pinning the collar in place to the tee shirt, where I wanted it to sit. At this point I cut out the tee-shirt collar with a scissors, cutting close to the seam to give me as much fabric as possible. I didn’t take a picture of this, but you’ll notice the collar is missing in all the pictures from here on out. I didn’t rip out the seam, I just cut the whole collar right off. 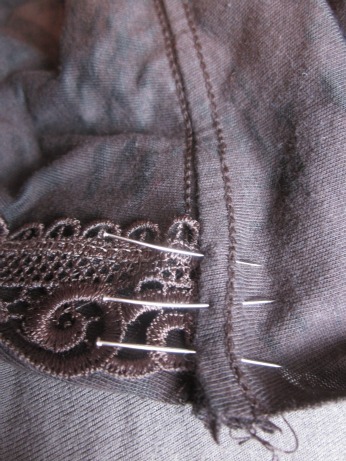 Then I opened the shoulder seam a couple of inches down from the neckline, using a seam ripper. 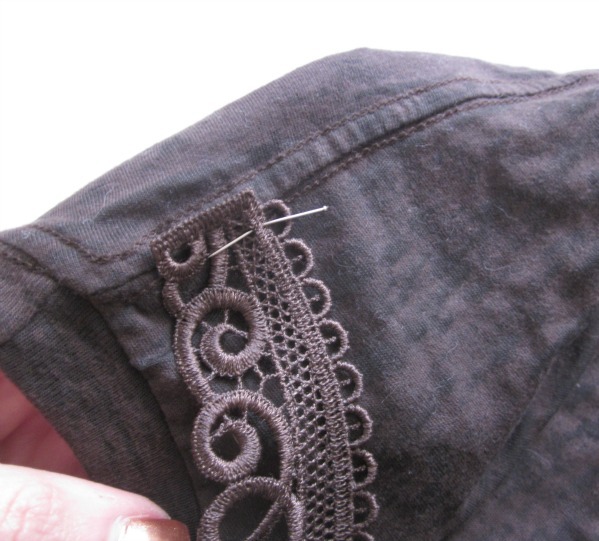 I tucked the end of the lace applique into the opened shoulder, and pinned it closed again…. 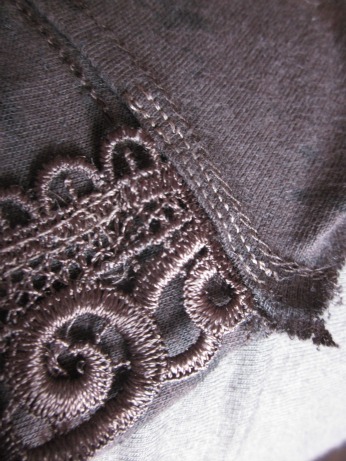 …and then stitched it in place, through the layers of tee shirt fabric and lace, together. 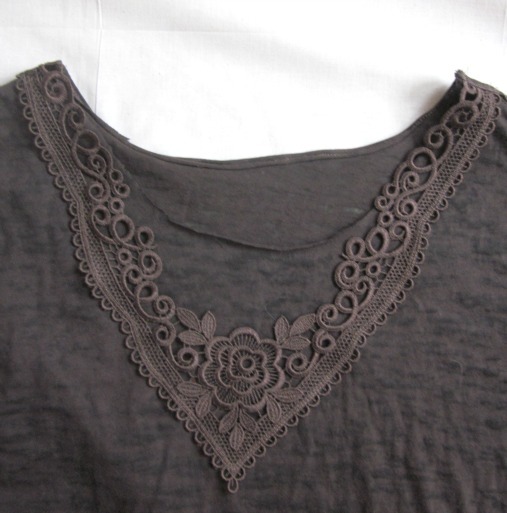 Then I turned to the inside and cut three snips to loosen the front of the tee shirt from its new lace panel: one at the top of each shoulder, next to the shoulder seam, and one down the center front, right to the point of the “V”. 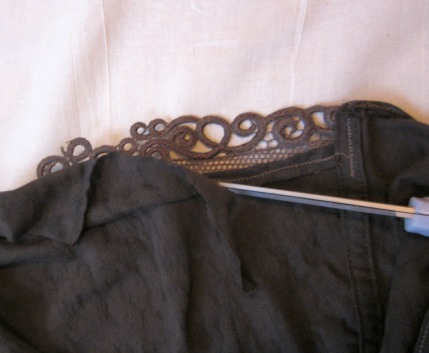 This allows me to fold back two panels and “hem” the inside of that neckline. 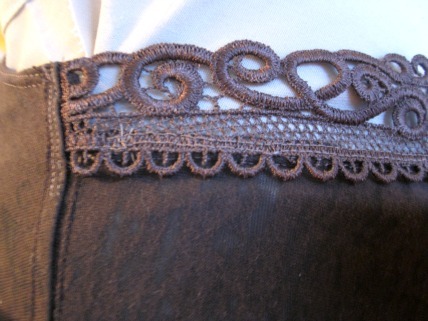 I also top-stitched that hem once, folding back the lace and stitching really close to it, so that those scallops would be held really smooth. I pressed the whole thing with a hot iron, and it was done. It didn’t take very long, and now it’s a totally femme and fun take on a sporty classic. Great photos and such a cool result! The mind is racing thinking of all the colors that this lace might come in to reproduce this for others! Love how this turned out and I (and my readers) love tee shirt makeovers. 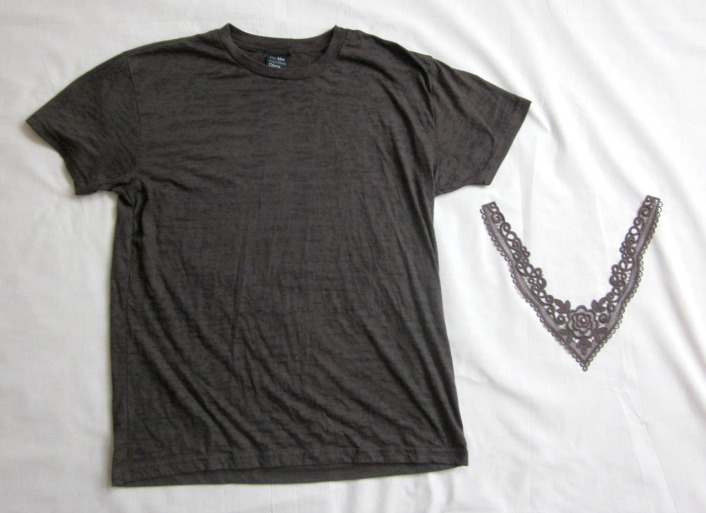 I posted the top pic and the before (tee shirt and lace) with a link back to you on my Tumblr blog truebluemeandyou. 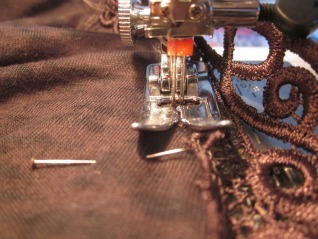 I have to giggle: all that work to make something that is de rigueur in fat girl sizes. I have a terrible time finding dressy shirts that >don’t< have lace or spangles or ruffles. But I also suspect yours fits a whole lot better than the mass-produced ones, is better constructed (not hard in fat girl land), and is a better quality lace as well. Most of what I make–well, maybe all of it, or nearly all– is readily available to buy, retail. But that’s not the point, is it? We don’t take the time to hand knit our own socks because we can’t find socks to buy in a store! What a super idea for turning a boring tee shirt into a lovely garment. You rock!